The Sun 3D newspaper on sale today - with 3D page 3, 3D editorial, 3D wall chart and 3D ads! Today the Sun newspaper is the first newspaper in the UK to publish with 3D editorial! This morning's 3D Sun comes with 3D glasses that readers are advised to 'keep handy for amazing Sun 3D pictures throughout the World Cup' and today's Sun newspaper has a selection of 3D imagery and 3D ads. The 3D Sun features a 3D page 3 with Abbey Clancy and other 3D editorial including 'Rooney', 'Kylie', 'Crocs', an 'Ugly Dog' and a 3D World Cup wallchart. The 3D Sun also carries 3D ads from B&Q, Toshiba, StreetDance 3D and FlyBe. There are limits to how much 3D printing can enhance a newspaper (bad printing or 3D????? 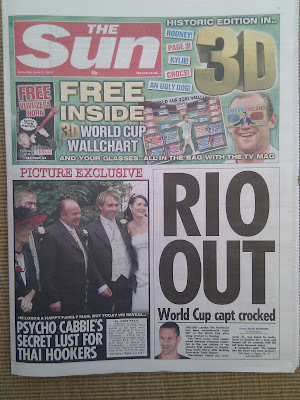 ), however the 3D Sun newspaper is fun and the 3D elements will undoubtedly be a circulation driver.